What are the Differences between Tungsten and Tungsten Carbide Rings? The tungsten ring market has grown at such a pace that awareness of such products has never been higher. Notably, it is the features of tungsten rings, such as durability, strength, and scratch resistance, which are making them popular as both wedding rings and as fashion purchases. However, many people do not know the differences between tungsten and tungsten carbide. These are definitely worth discovering, as they can be the difference between a high quality product and a poor one. The biggest and most important difference between them is that tungsten refers to the individual metal, whereas tungsten carbide is an alloy of tungsten and predominantly carbon, although nickel and titanium are among the other metals that might be used. Some websites and jewelers will use the two interchangeably. While most good tungsten carbide ring sellers will list them as tungsten rings for simplicity, you will probably want to check that you are in fact shopping for tungsten carbide, rather than tungsten itself. The reason for this is that tungsten, as a standalone metal, is actually quite difficult to construct into a ring. 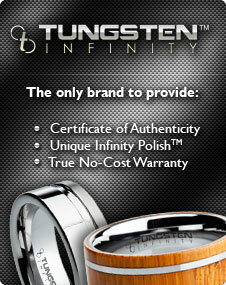 While a 100% tungsten ring would be strong, it would not be as durable or resistant as a tungsten carbide alternative. The combination of metals in the alloy is what makes tungsten carbide so strong and durable, as well as shiny and expensive looking. While tungsten by itself is a strong metal, combining it with others helps to maximize its positive characteristics, and enables a wide range of tungsten rings that are perfect for any occasion to be produced. Be sure to check the secondary metal that has been added to the tungsten in producing the tungsten carbide for your ring, as less durable metals will often be used, thus creating a ring weaker and less desirable than a tungsten carbide one. A good indicator of this will be the price; cheap tungsten carbide rings will often be made of weaker materials. It might be difficult to find a difference between tungsten and tungsten carbide rings on retailers websites. However, by knowing that a difference does exist, you are set up to ensure you do not unwittingly purchase a weaker, lower quality ring.